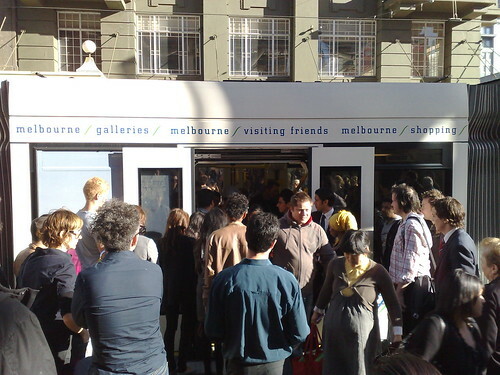 Similar scenes are seen in morning peak around much of the tram network, during the lunchtime rush in the CBD, as well as the evening peak, as well as weekends. Now imagine it with Myki: everyone touching-on and off their cards as they board and alight, at 2 seconds+ per transaction. If they can speed up the scanners, that will help. This video shows that a Hong Kong Octopus scanner takes only about 0.3 seconds to respond. But even that may only go so far. Putting scanners on tram platform stops would also help, but there’d have to be some way for people getting off the tram to tell there was a scanner on the platform they could use, otherwise that wouldn’t work either. Another idea is, noting that most bus and tram trips are short distances anyway, making them a flat fare like London’s buses and trams, so you don’t have to touch-off. If nothing happens, expect the trams to get even slower than they are now. this is going to be such a fail if this is how long the scanners will take to work. I personally predict that “scan off”, at least on trams and buses, will be dropped with in six months of myki implementation. Nathan: OOooh, I never considered that the annoyingly stupid bits might be changed. That gives me hope! Apart from a lot of bad thoughts on myki one I have is that it should be a flat $2.50 accross the whole network for five hours from time of validation – do away with zones. Simple; swipe on get charged $2.50, travel, get off – no further action required. Kris is on my wavelength. but at all time, not just peak. Have a space between front door and validator/tram entry for passengers to congregate whilst they wait to move into the tram so that the tram can move on. One thing that I find hard to conveive is the recharging of cards. You can do it over the www. How does the recharge get to your card? Is every validator on every tram and bus and station going to have a record of your balance and update it when you next swipe? What if you swipe twice? do you get two credits? The overhead to store that info is ridiculous. The band width required to do it in real time, ie. Tram -> central -> tram -> card is ridiculous. Expecting me to recharge online and then front at a station booking office to get it applied is ridiculous. Kris: I don’t see how that’s practical in crowded conditions; it was tried for 20 years with the Z-class trams, and was messy. It would be even worse now with wheelchairs and prams, some of which can’t physically fit down the aisles of trams. Providing multiple platforms would require massive investment. Kerbside scanners may be the way to go, but it would need to be consistent so you knew when one was available when alighting. Nigel: The problem with a completely flat fare system is that Myki doesn’t just cover Melbourne. It covers most of Victoria. I also don’t think it’s equitable to charge the same for a trip two stops down Swanston St as it is to charge for a trip from Werribee to Pakenham. The topping-up of cards has some interesting fine print attached to it. Page 87 (I think) of the Fares and Ticketing Manual notes that any top-ups applied off the system (eg including via the Web) may take up to 24 hours to reach the card. The implication is that such transactions are transferred onto the individual buses/trams only when they’re in the depot and have their Myki equipment synchronised with the central servers. It may be a bit quicker for railway station machines, which it seems are hard-wired. It would appear that the easiest way to get an instant topup is to do it on a bus (cash only), tram (cash only) or at a station (cash or card). Jason, here’s my post on that particular topic. The main point is that cost isn’t the reason most people drive instead of using PT.